I wrote up Xardion and I am still trying to gather the motivation to properly write up Quattro Arcade from last fall. But I just want to play a new SNES game. 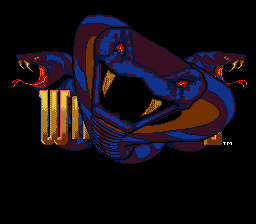 By chance, the one I chose at random happened to be a casual puzzle game that will not take much thought investment: WildSnake. Yes, it’s quite understandable and natural that you will have the song Wild Thing with slightly altered lyrics running through your head as you read this review. WildSnake is a puzzle game inspired by the Tetris legacy. 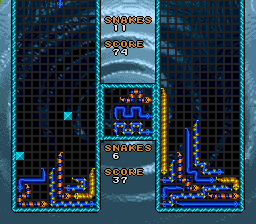 In this game, the player contends with snakes of varying colors and lengths falling from the top of the screen and slithering to the bottom. Obviously, the goal must be to clear out snakes but how was not immediately clear. It turns out that the key is for one snake to touch another snake of the same pattern using its head. There are 4 backgrounds and 7 grid types to choose from. Pictured above is the grass background with the flask grid type. Also seen in the picture is the rare iron snake or barrel snake (lacking a manual, I had to make up my own name for him)– he comes barreling down the screen on a fixed path over which you exercise no control, eliminating all snakes in his path. Thus, he is helpful. The screenshot shows some random obstacles in the first player’s game grid. 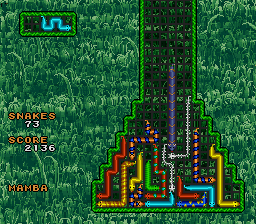 That occurs as a result of the second player scoring multiple snake eliminations on one snake drop, which is a nice competitive touch. My all-time favorite puzzle game is Dr. Mario for the NES. I was able to work up a lot of strategy for that game because the game screen remained relatively static. It’s considerably tougher to devise any kind of real time strategy for this game. The snakes keep slithering until their heads touch an obstacle. When a snake is eliminated, the entire pile of snakes is often jostled into new positions. Still, it was enjoyable to collect a diverse set of screenshots and I gave it my best shot every time. Not the finest SNES game I have ever played, but substantially better than last night’s ordeal. This game is awesome. I’m glad to see it covered somewhere. Puzzle games don’t get enough love.